Hume Doors is Australia’s largest, 100% locally-owned timber door manufacturer. For sixty years, they have led the way in design, technology and materials. But by 2013, it became clear to Hume’s leadership that the safety standards developed for their plants did not align with their vision for a safe and healthy workplace. The decision was made to develop an industry-leading safety system. 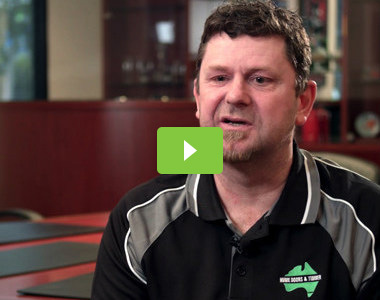 Working with Work Safety Hub, Hume Doors has transformed itself from a successful business to a world-class leader by matching employee safety with productivity. The Hume Doors & Timber plant in Dandenong, south of Melbourne, produces thousands of doors from a vast range of specialty products and has 200 employees. Workers are potentially exposed to dangerous fire, explosions, and musculoskeletal and machinery-related risks, as the production of doors requires the use of high-speed, computer-controlled routers, that also produce large volumes of dust. Additionally, Communication and training can be challenging due to the large number of languages spoken by plant employees. Hume management wanted to exceed the top Australian safety standards. Laws and requirements for factories set by the various Australian state governments were insufficient for the forward-thinking company. To transform its safety practices, Hume decided to work with Work Safety Hub. The first Work Safety Hub audit of the Dandenong plant took place in 2013. The Work Safety Hub consultants came to the site and interacted with the workers – all of the workers, from the most unskilled junior worker to the management. They started from the shop floor and worked their way upward, to the plant supervisors and the owner of the company. The Work Safety Hub solution addressed two major areas: process safety procedural changes and personnel safety, including the adoption of a safety culture. But one of the first priorities was ensuring complete commitment from management to implement changes and adhere to best practices. '‘We were very lucky because there was real commitment from the management. They are what you would call trailblazers,' said Jason Miller, project manager for the Work Safety Hub team in Victoria.Hume’s top and middle management received training from Work Safety Hub safety specialists. To pass this crucial knowledge onto floor workers, Hume employed several strategies developed by Work Safety Hub. Managers and supervisors began classroom-style trainings of shop-level employees as well as all new hires. Employees were taught to practice self-audits of their safety practices on a daily basis. Hume is decreasing injury rates significantly. Along with the positive changes in safety statistics, Hume Doors and Timber has posted impressive business growth data. Company profits increased and management has acknowledged a more safety-oriented culture on the plant floor. Hume Doors & Timber is also a certified member of the Forest Stewardship Council as well as a member of the Programme for the Endorsement of Forest Certification Schemes. By now aligning the new safety management system with recognisable standards, Hume Doors is demonstrating its commitment to human rights principles supporting health and safety of people at work. Hume’s experience with Work Safety Hub has proven so positive that the company is implementing its new safety practices for its other Australian operations. Hume also signed an additional 12 month contract with Work Safety Hub in 2014. Work Safety Hub practices will play a major role in the businesses growth as Hume’s plants become some of the largest plants of their kind in Australia. Hume Doors & Timber employs 1,500 people Australia wide and have the capacity to produce approximately 250,000 doors a month.